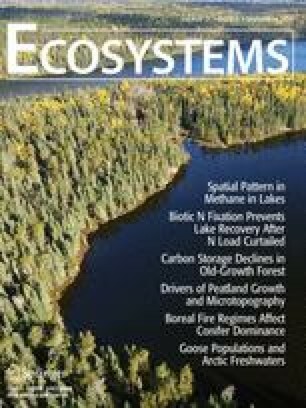 The boreal forest plays a critical role in regulating global atmospheric carbon dioxide and is highly influenced by wildfire. However, the long-term recovery of forest carbon (C) storage following wildfire remains unclear, especially during late succession. Uncertainty surrounding C storage in old forests largely stems from both a lack of repeated measurements in forest stands older than the longevity of the pioneer cohort and a lack of consideration of multiple succession pathways. In this study, we constructed a replicated chronosequence, which covered a wide range of forest stand age classes (up to 210 years old) following fire in the boreal forest of central Canada. We selected stands of different overstorey types (that is, broadleaf, conifer, or mixedwood) and age classes to account for multiple succession pathways known to occur in our study area. Our results show a strong relationship between total ecosystem C storage and stand age following fire. Broadleaf stands had on average higher total ecosystem C; however, the inferred temporal dynamics of total ecosystem C were similar among all three overstorey types. Importantly, we found that total ecosystem C storage declined from canopy transition to late-succession stages, irrespective of succession pathway, contradicting views that old forests continually accumulate C as they age. Our findings emphasize that further study of stands older than the longevity of the pioneer cohort is critical to better understand the contribution of old forests to the global C cycle. BG and HYHC conceived of or designed study; BG, PK, ZM, and AMH performed research; BG and EBS analyzed data; BG, ART, HYHC, and EBS wrote the paper. The online version of this article ( https://doi.org/10.1007/s10021-017-0210-4) contains supplementary material, which is available to authorized users. We would like to thank Amber Brant for her help in collecting the large tree inventory data. We are also thankful to Le Wang, Sa Xiao, Wanwen Yu, Magali Furlan Nehemy, and Yu Zhang for the assistance with field work and data analysis. Valuable comments from Dr. Rupert Seidl, Caroline Simpson, and the anonymous reviewers are greatly appreciated. This study was funded by the Natural Sciences and Engineering Research Council of Canada Strategic Grant Project (STPGP428641). Environment Canada. 2017. Canadian Climate Normals 1981–2010. http://climate.weather.gc.ca/climate_normals/index_e.html. R Development Core Team. 2017. R: a language and environment for statistical computing. Vienna: R Foundation for Statistical Computing. https://www.r-project.org/.